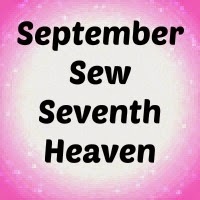 Make a Garment a Month Challenge: September's Sewing Theme. I've finally worked out the September theme, which took a little bit of sideways thinking. September is one of those months where the word September doesn't have an inspirational etymology that serves as a source of theme ideas. September stands for the seventh month - and when Augustus Caesar decided to change the calender (for reasons I haven't traced ) he moved it to the ninth month position. So far not much inspiration. That gave me something to work with. We are all entering a new season, a new fashion beginning for sewing. We are also very lucky ladies in that we live very blessed lives - I can't help but think sadly about all our unfortunate sisters in parts of the world where they are suffering under great hardship with very unstable conditions and brutality around them. While I tend to stick to sewing in my blog world - it's an upbeat space away from other sides of life - I do think we should all count our blessings when planning our sewing this month. We are all very privileged. So let's start planning our fall/winter or spring/summer wardrobes (depending on where you live). And make the first garment towards that this month. Sarahliz, what a perfect idea for September's challenge.. Perfect time to think fall wardrobe. Looking forward to sewing in September.. I too, feel so blessed. and my heart goes out to our sisters who are living such hard lives. Yes, I agree - sewing is often separated from the rest of our lives - an upbeat space as you put it - but you just need to turn on the news or even answer the door to find those with less blessed lives. Yes, I'll try to start planning my autumn/winter wardrobe.